This course is full to capacity but we are accepting waitlist registrations online. In this comprehensive, hands-on workshop for general dentists, participants will learn basic to advanced concepts and skills in oral surgery. 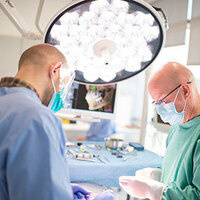 Starting with patient evaluation, the course will cover medical conditions that impact surgery, computer imaging, local anesthesia, surgical anatomy, surgical techniques and instrumentation. You will learn the latest techniques for flaps and sutures, third molar extraction and alternative techniques in extraction of impacted third molars. Clinical risks and complications of these procedures will be examined with an emphasis on how to prevent problems. Participants will have the opportunity to apply newly learned concepts as they practice surgical extraction techniques, flaps and suturing on pig jaws. This program is designed for general dentists interested in oral surgery concepts and skills. Credits: This activity is designated for 7.5 units of continuing education credit. Len Tolstunov, DDS, DMS, is a board-certified oral and maxillofacial surgeon and a diplomate of the American Board of the Oral and Maxillofacial Surgery, the American Board of Oral Implantology/Implant Dentistry and the International Congress of Oral Implantologists. He has conducted clinical research in oral surgery and implant dentistry, has published more than 35 articles in peer-review journals and is an editor of two books on bone augmentation in implant dentistry. He speaks nationally and internationally and teaches at the Dugoni School and UCSF School of Dentistry.